Android is a mobile operating system, developed by Google, dependent on the Linux kernel and designed especially for smartphones and tablets devices. Google have listed the sweet names in the alphabetical order. Android versions 4.1, and 4.3, were named as Jelly Bean, the well-known OS for smartphones. Jelly Bean is a comeback version and it enhances the UI speed and responsiveness, along with redesigned notification API, making the notifications to be extended to comprise widget-like functionality. 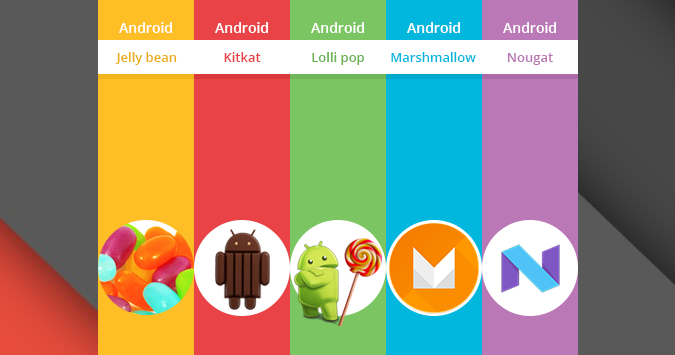 Among the Android versions,most reached version is KitKatOS. Today, 10 millions of smartphone and tablet users enjoy the taste of KitKat. KitKat is alive on the Android backdrop since it goes well with the latest devices and the users. The Prominent change in Lollipop release is Material Design, the user interface constructed around a design language. Another alteration includes battery consumption via a series of optimizations and notification in the lock screen features. In addition to this, Smart Lock like pin and pattern lock screens are also added from the hired android app experts. This Android 6.0 Marshmallow updates bring out a lot of the fresh features and alteration. Google has hired android app developers into Marshmallow against the Android 5.1 Lollipop. Consequently, most of the alterations are behind the surface, and they are not explicit. Eventually, at first glance things may appear very alike, yet there are heaps of exciting features for the users. Nougat is the 7th chief version of operating system in the Android. The new OS is loaded with new features and updates, each one enhancing upon the Android experience from the hired dedicated android developers.